Since 2001 VDL has been developing container AGVs in close cooperation with container terminal operators. Therefore, VDL modular AGV was originally designed for container handling purposes. VDL Automated Vehicles is the world’s only company supplying automated transport solutions in- and outside container ports. The modular vehicle concept provides the solution for all local environmental & climatological conditions and technological expectations. It enables VDL to offer the suitable AGV specifications to each customer case. Besides engineered ideas, VDL is also open to implement components or concepts sourced or recommended by its customers. VDL prefers to manufacture and assemble all products in the Netherlands, resulting in a strong connection between the development- and manufacturing teams. Being part of VDL Groep offers major flexibility advantages. 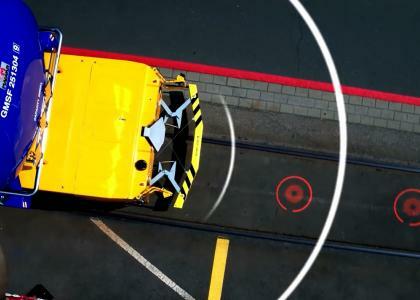 Therefore, VDL Automated Vehicles is able to up- and downscale operations rapidly, providing batches that differ from just a couple of AGVs to hundreds. Making use of high-end proven technology and extensive test procedures, VDL container AGVs operate with the highest MTBF and lowest cost of ownership. All components – from electronic cabinets, chassis frame till suspension concepts – originate from this transport solution heritage. Studies showed that vibration while operating equipment is one of the main reasons for breakdowns. Thanks to our knowledge in suspension development, we were able to reduce vibration impact by 80%. Furthermore, VDL container AGVs are designed to operate with low maintenance requirements. Focussing on customer satisfaction is what makes VDL the preferred container AGV supplier. Automated transport solutions for special cargo are similar to automated container handling solutions, but require more attention to adapt to the customer's logistic process. There are some extra challenges to cope with compared to situations in container terminals. 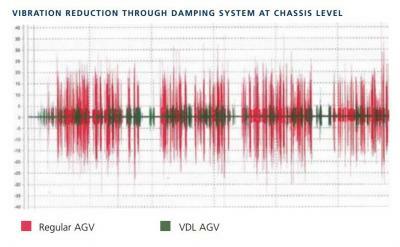 VDL Automated Vehicles has proven to be the first company to operate AGVs in mixed traffic! To date suppliers have always seperated AGVs from other traffic. VDL has managed to reach a legislative and technical levels to drive an AGV on the industrial premesis of BASF Ludwigshafen. The chassis is supported by 32 wheels with 8 steerable axles which provide the load to be evenly spread across the surface. 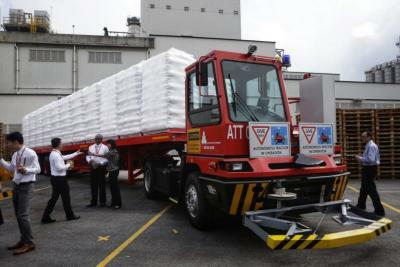 This allows the loaded vehicle (which can exceed 100 tonnes) to drive on regular roads without causing any damage. By the use of AGVs in the flexible concept of tank container handling BASF has managed to reduce the transport cycle from 22 to just 1 hour. This results in an increase of road transport productivity by 28% in a 50,000 employee chemical plant. 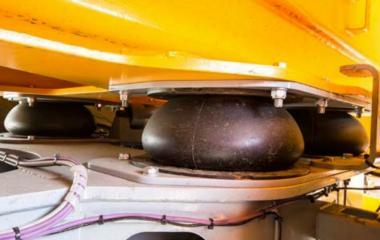 Furthermore, the tank containers have a capacity up to 73,000 liters and a payload of 66 metric tons each. 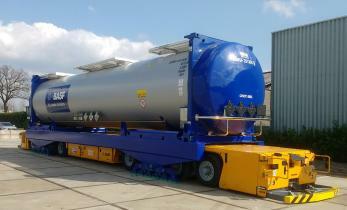 They are fitted inside a 20, 45 or 52 foot frame which is can be placed on an AGV rack and transported by road. VDL Automated Vehicles has done several case studies for customers in logistic sector. In practice, autonomous vehicles are implemented as part of a complete automated horizontal transport system. Usually this includes; fleet management system, infrastructure, vehicle guidance software and modified vehicle(s). The vehicle itself does not contain intelligence to generate jobs combined with according route planning. The FMS supervises which vehicle to control and what route to take. The system collects, processes and transmits all data gathered by independent vehicles to guide most efficient overall route planning to all vehicles. The concept of VDL Automated Truck was developed in line with solution for logistic customer. Design was setup as modular concept to enable implementation of VDL AGV modules in Automated Trucks, simplifying technical and legislative issues for autonomous driving. Development of the VDL Automated Truck is a strategic step for VDL towards becoming lead supplier of E-mobility in heavy industry. Furthermore, this project is forerunner of fully automated VDL E-Truck made for public road transport. Carrying over 20 years of experience in this sector enables VDL to deliver these top quality products consisting proven technology. Development of VDL Enhanced Navigation is done in close cooperation with TNO Helmond. Although ongoing engineering, the software has been in succesful operation in port areas since 2016. In order to enable very precise and fast navigation, software engineering teams are still involved through continuous performance optimisation. Currently VDL Enhanced Navigation contains the following features. VDL Enhanced Navigation is able to accurately position 16 m long vehicles at ±3 cm distance. 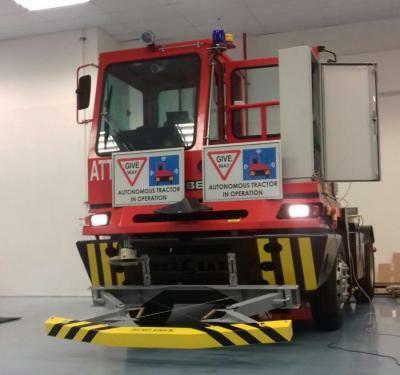 This functionality is crucial due to the highly autonomous operating environment in which most AGVs operate. 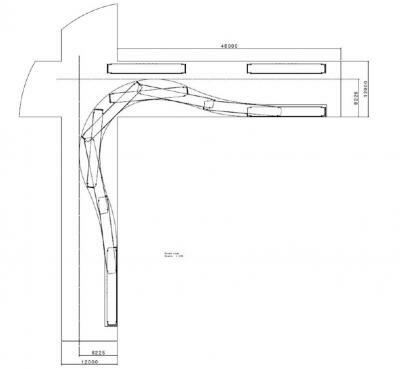 Precise positioning can be applied to any project depending on available infrastructure. Why choose for automated transport solution? They are establishing an innovation center in Singapore and are very ambitious here. Furthermore VDL has already successfully implemented similar projects in Europe. VDL Groep has announced the ambition to become a world player in the electrification of so-called heavy-duty mobility. VDL also aims to take up a leading position in the field of battery management systems, charging infrastructure and energy storage.